Courtesy of Pabalyn Properties, Ryan McMahon. 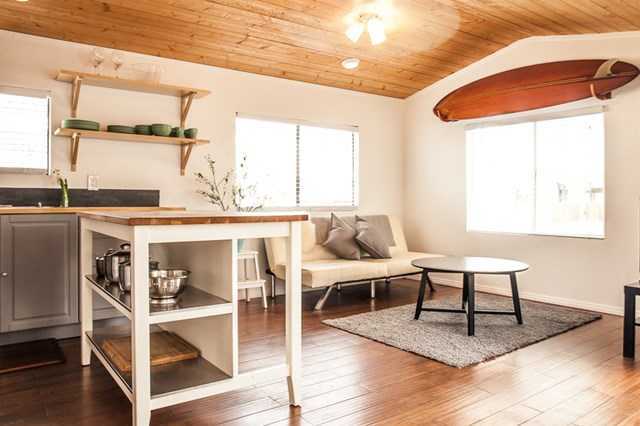 Come see this beautiful beach cottage in Leucadia just 1/2 block from the pacific ocean. Fully rehabbed top to bottom over the last few years. Turn-key, move in ready and newly remodeled. Beautiful raised vaulted wooden ceilings, new floors, new pipes, new bathroom, new kitchen, new roof. It is freshly painted inside and out. One of the last lots in the park that has horizontal space to expand. This little gem is a life style enhancement as a summer get away, or a second home, or investment property.